Our memory book is 8.5"X11", has ten different sections, and is printed in full color with a glossy cover and is shipped to classmates in a plain white envelope to protect it. We offer two programs for our Memory Books. We recognize that the Reunion Committee wants to keep their reunion ticket price as low as possible and offer a discount on our Memory Books. If the Memory Book is included as part of the reunion ticket price we offer our memory books for $20, postage paid, and no sales tax with minimum order of 50 books. 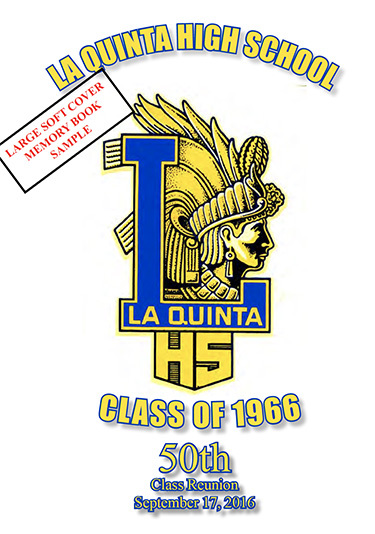 Our other program is to offer the books to the classmates at $25 per book, postage paid, no sales tax or postage if ordered at the reunion. We offer memory book flyers to the Reunion Committee to help promote these sales. The Memory Book can be customized to fit your needs. We can add any pictures you might have, and also customize the cover design to your specifications. There is no charge for color ink on the book covers. We provide free Memory Book Flyers to promote them to your classmates. A sample of what a Memory Book looks like is shown in the PDF below.